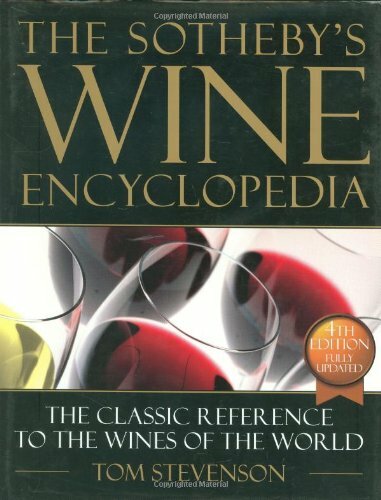 Featuring a regional Best Wines chart, a Troubleshooters' guide to potential wine faults, and a Taste Chart to identify flavors in a wine, this definitive, updated, geographically organized encyclopedia of wine identifies wines made in France, Germany, Italy, Spain, Portugal, Africa, Australia, New Zealand, North and South America, and the Far East. Amazon.com description: Product Description: Perfect for novices, wine enthusiasts, or experts, this book's easy-to-use style and practical advice make it an unrivaled visual reference. Updated and expanded with the latest information on all the wine-producing areas of the world. About: Reflecting recent changes in the dynamic world of wine, with special sections devoted to the countries of Southeast Europe and the Eastern Mediterranean, The Sotheby's Wine Encyclopedia is the most up-to-date and comprehensive wine reference in the world. About: A guide to wine and wine making presents information about wine-growing regions, factors that affect the taste and quality of each region's wine, an overview of the producers and their vintages, and starred reviews. About: Featuring a regional Best Wines chart, a Troubleshooters' guide to potential wine faults, and a Taste Chart to identify flavors in a wine, this definitive, updated, geographically organized encyclopedia of wine identifies wines made in France, Germany, Italy, Spain, Portugal, Africa, Australia, New Zealand, North and South America, and the Far East.